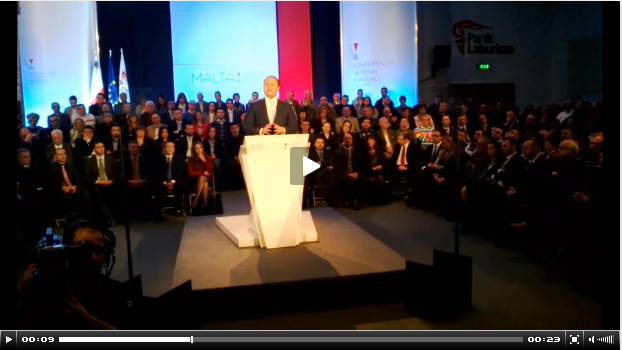 Times of Malta 09/02/2014: Prime minister Joseph Muscat said today that Malta has to become a land of opportunity, a land of equality and a land of innovation. Concluding the annual general conference of the Labour Party, Dr Muscat said Malta was ready and able to compete to be the best. It had shed its inferiority complex. The new generation was ambitious in the good sense, he said. This was not a generation that was satisfied just with what it was given. This was a generation which sought new ways to create wealth. This was an era of the social networks. One had to defend one's identity not by refusing change and being insular, but by being relevant, by thinking global and by embracing change. The Maltese had to be reasonable as well as firm, confident in their abilities to make their country a land of opportunity which created good jobs for its people, created the right business environment and made Malta a natural...read on.